What's a flexible, strong string or yarn I can use in this toy? 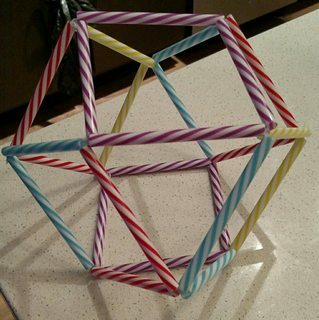 I made this flexible geometry toy based on one I saw in a learning store. 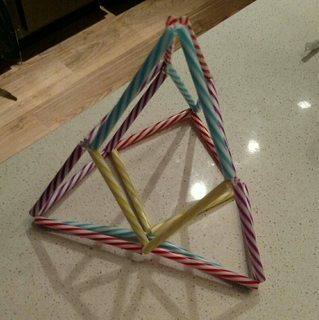 You can bend it into different shapes, and it's fun. Unfortunately, all I had on hand was some yarn to make the inside support. I'm concerned that the yarn is eventually going to snap, or the knot is going to unravel. It's also not water-proof, so it might not be that great for extended kid use due to the messes they make. Instead of yarn or thread, would fishing line work for you? Is made to be in water. A lil drop of superglue on the knot will lock it down, the liquid kind, not a gel. It wicks into the fibers. Superglue, or any cyanoacrylate-based glue works great on fishing line as well. Maybe try mason'-s line at a hardware store. It's the string they stretch and place a hanging level on. It usually comes in hot pink or other bright colors. You could also use beading wire, like SoftFlex. It is designed to be knotted and has a nylon coating that will protect it from moisture. 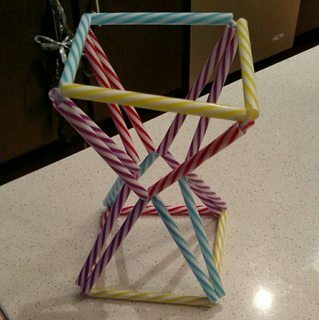 However @martha is correct that you will have issues with the line cutting through the straws. Very thin paracord might work, but you may still have issues with mustiness. And regarding securing your knots...there is a knot called the fisherman's knot for a reason. Fishing cord can be super slick. Check this out for instructions. (I just noticed that you asked the question that I linked to, so maybe the fishermans knot didn't actually work for you. Sorry about that). There are also a lot of great tutorials about knot tying on-line, and they will often break the different knot types down by usage. Look for knots specifically used for fishing, and you should find some good knots for securing fishing line. String from the baker, the kind they wrap around the box. A good alternative would be Dental floss. It looks like nylon cord could be used. If more flex is desirable then a braided rubber cord. Some rubber is of poor quality, becoming brittle after a few years and breaking easily. Not the answer you're looking for? Browse other questions tagged material-selection or ask your own question. How to knot an elastic cord into a circle? What materials can I use in a kids project to simulate simple cell biology? What is the “elasticized leather” lacing shown in this photo? What sort of materials can I use to make a latex mask look wet without actually being wet? What are some DIY simple tools to use to make a model scale home? What's the name of this type of acrylic? What kind of paper can I use in place of U.S. currency for origami? How can I make solid fake soil?